Archaeologists in Guatemala have discovered the tomb of Lady K'abel, a seventh-century Maya Holy Snake Lord considered one of the great queens of Classic Maya civilization. The tomb was discovered during excavations of the royal Maya city of El Perú-Waka' in northwestern Petén, Guatemala, by a team of archaeologists led by Washington University in St. Louis' David Freidel, co-director of the expedition. A small, carved alabaster jar found in the burial chamber caused the archaeologists to conclude the tomb was that of Lady K'abel. 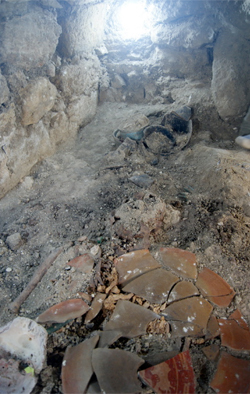 The white jar is carved as a conch shell, with a head and arm of an aged woman emerging from the opening. The depiction of the woman, mature with a lined face and a strand of hair in front of her ear, and four glyphs carved into the jar, point to the jar as belonging to K'abel. Based on this and other evidence, including ceramic vessels found in the tomb and stela (large stone slab) carvings on the outside, the tomb is likely that of K'abel, says Freidel, PhD, professor of anthropology in Arts & Sciences and Maya scholar. WUSTL archaeologist David Freidel, PhD, was part of a team that discovered the tomb of Lady K’abel, a seventh-century Maya Holy Snake Lord considered one of the great queens of Classic Maya civilization. "The Classic Maya civilization is the only 'classical' archaeological field in the New World—in the sense that like archaeology in Ancient Egypt, Greece, Mesopotamia or China, there is both an archaeological material record and an historical record based on texts and images," Freidel says. "The precise nature of the text and image information on the white stone jar and its tomb context constitute a remarkable and rare conjunction of these two kinds of records in the Maya area." The discovery of the tomb of the great queen was "serendipitous, to put it mildly," Freidel says. 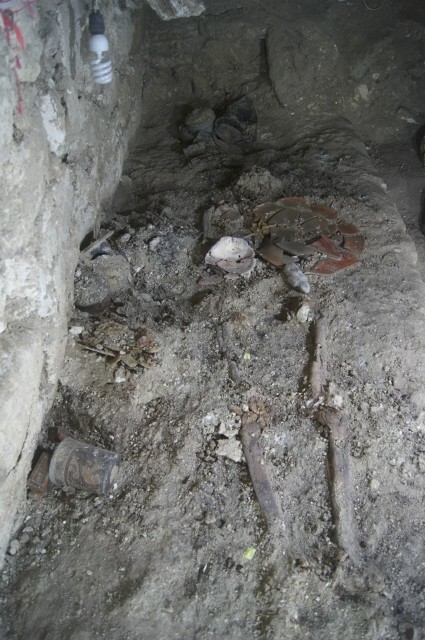 The team at El Perú-Waka' has focused on uncovering and studying "ritually-charged" features such as shrines, altars and dedicatory offerings rather than on locating burial locations of particular individuals. "In retrospect, it makes a lot of sense that the people of Waka' buried her in this particularly prominent place in their city," Freidel says. 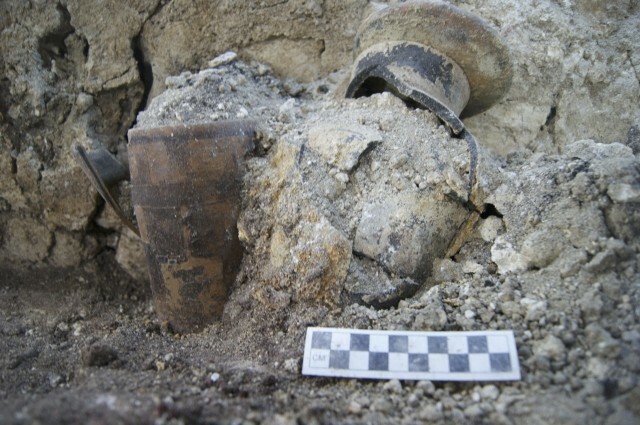 Olivia Navarro-Farr, PhD, assistant professor of anthropology at the College of Wooster in Ohio, originally began excavating the locale while still a doctoral student of Freidel's. Continuing to investigate this area this season was of major interest to both she and Freidel because it had been the location of a temple that received much reverence and ritual attention for generations after the fall of the dynasty at El Perú. With the discovery, archaeologists now understand the likely reason why the temple was so revered: K'abel was buried there, Freidel says. Drawing of the glyphs on the back of the alabaster vessel (pictured at top of story) by Stanley Guenter. K'abel, considered the greatest ruler of the Late Classic period, ruled with her husband, K'inich Bahlam, for at least 20 years (672-692 AD), Freidel says. She was the military governor of the Wak kingdom for her family, the imperial house of the Snake King, and she carried the title "Kaloomte'," translated to "Supreme Warrior," higher in authority than her husband, the king. 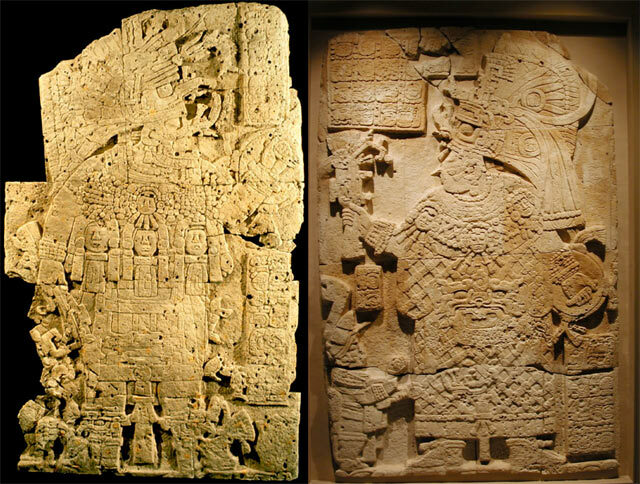 K'abel also is famous for her portrayal on the famous Maya stela, Stela 34 of El Perú, now in the Cleveland Art Museum. El Perú-Waka', located approximately 75 km west of the famous city of Tikal, is an ancient Maya city in northwestern Petén, Guatemala. It was part of Classic Maya civilization (200-900 AD) in the southern lowlands and consists of nearly a square kilometer of plazas, palaces, temple pyramids and residences surrounded by many square kilometers of dispersed residences and temples. 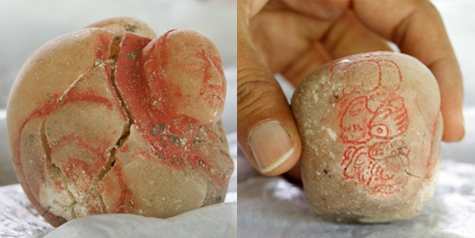 This discovery was made under the auspices of the National Institute of Anthropology and History in Guatemala. The El Perú-Waka' project is sponsored by the Foundation for the Cultural and Natural Patrimony of Guatemala (PACUNAM). More information: Along with David Freidel, professor of anthropology at WUSTL, the project is co-directed by Juan Carlos Pérez, former vice minister of culture for cultural heritage of Guatemala. Olivia Navarro-Farr, assistant professor of anthropology at the College of Wooster in Ohio, directed the excavations with Griselda Pérez Robles, former director of prehistoric monuments in the National Institute of Anthropology and History, and archaeologist Damaris Menéndez.